With Broome’s cultural diversity, amazing coastline and laid back feel, pretty well makes it a holiday destination in itself. The Kimberley is renowned for its massive tides and one place you can witness it firsthand is at the infamous Cable Beach. 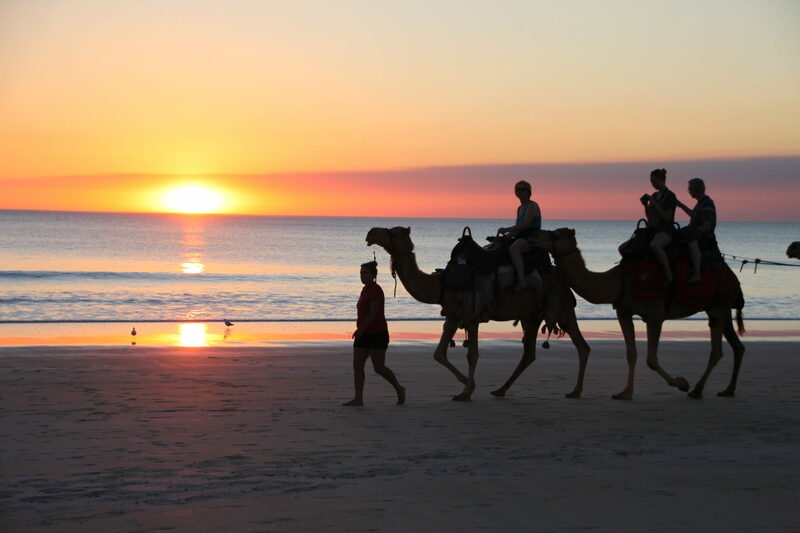 It’s popular with locals and visitors alike, and there’s nothing that screams Kimberley more than seeing the camels along Cable Beach at sunset. It’s a spectacular sight and something that you need to experience at least once. Head down to the beach during the afternoon, set yourself up with some drinks and nibbles, play a game of Frisbee or beach cricket, and watch an amazing sunset. As there is always something happening in Broome, make sure you pick up a guide from the Visitor’s Centre to see what’s on during your stay. One thing we always do during our stay is visit the Courthouse Markets. Check out the many handicrafts, gifts and delicious food that’s on offer. The market is open on weekends during the main tourist season. Around town, make sure you allow a night to visit Sun Pictures, Australia’s oldest outdoor picture theatre. Being able to sit outside on slung chairs under a starry balmy Broome night watching a movie is pretty memorable. You can even watch the planes fly over while you watch the movie! There are many low cost things to do around Broome and one of these is the Staircase to the Moon. 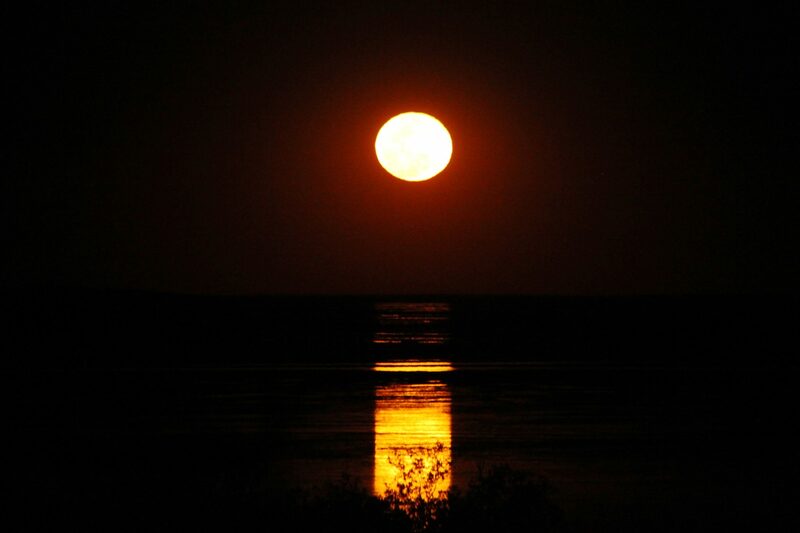 Time your visit to coincide with a full moon, and you can watch it rise with its reflection on the mudflats creating the effect of a staircase. Set yourself up early at one of the prime vantage points around town well before sunset, as it can often be standing room only. We generally choose Town Beach to witness it as the night markets are on during a full moon, and the atmosphere around there has a good vibe. If you’re going to be heading up the Dampier Peninsula, use Broome to re-stock and refuel before you leave. Road conditions up there vary from bitumen to dirt, so running the right tyre pressures is paramount. There are plenty of opportunities for camping along the peninsula, with two of our free camp picks being Prices Point and Quandong Point. Both will have you perched high up on the cliffs overlooking the spectacular turquoise coloured Indian Ocean, so you may find it’s one area you just won’t want to leave! Further up the peninsula, visit Kooljaman for a unique camping experience in one of their beach shelters. Sit back and relax in your very own beach hut as you’re only a stone’s throw to some of the best looking coastline in Australia. Late in the afternoon, drive down to Western Beach and soak up some of the best Kimberley sunsets you’ll ever see. 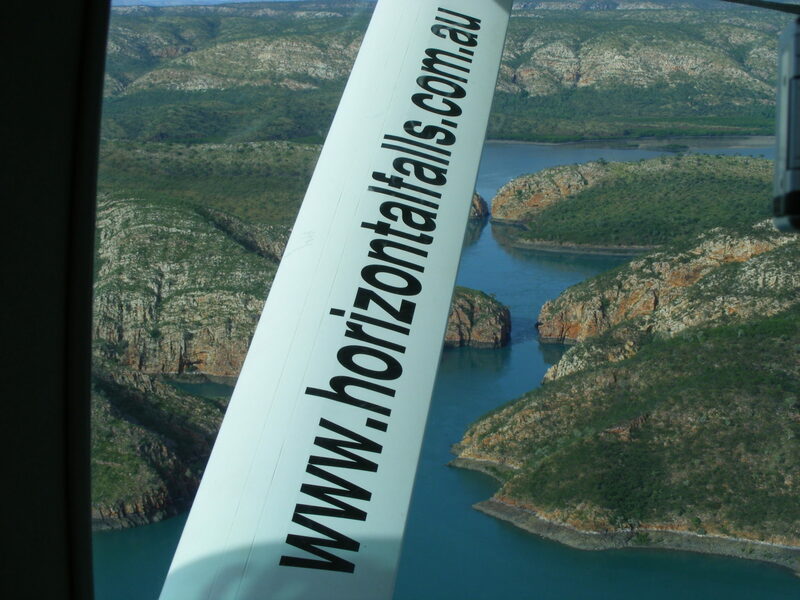 At the tip of the peninsula, visit Ardyaloon at One Arm Point to learn all about aquatic life on the Dampier Peninsula. The community runs tours on their Trochus hatchery which is a great learning experience for both adults and children. Cygnet Bay also offers camping along the eastern side of the peninsula. While here, enjoy their magnificent Big Tide tour where you actually get to see a waterfall out at sea. It’s a thrilling ride through whirlpools, so strap yourself in, have your camera at the ready, and be prepared for one hell of a boat ride! Before you leave the peninsula, you can’t come all this way without a visit to the beautiful 100 year old church at Beagle Bay. The church’s mother of pearl altar truly makes it a Kimberley icon. If your Kimberley adventure includes a visit to Derby, then a visit to the old prison boab tree is a must. It’s a reminder of the sad history around here and one that should not be forgotten. A short distance away is the incredible Myall’s Bore. It would have been a sensational sight to see this 120 metre long concrete trough used to water up to 500 head of cattle at a time many years ago. While you’re in Derby, check out the Wharfinger Museum, the old prison on Loch Street, and watch a magnificent sunset from the wharf. Arrive early at the wharf as the jetty at sunset can be busy with visitors and locals. For a treat, take a night off from cooking and grab yourself some fish and chips from the jetty kiosk…we can vouch that they’re pretty good! For a completely unique attraction to visit from Derby, it has to be the Horizontal Waterfalls. 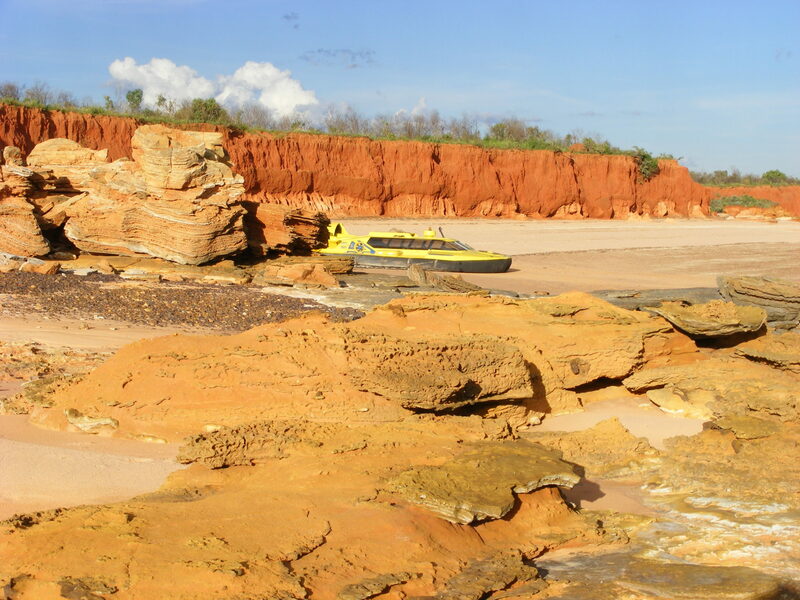 We’ve found that tours leaving from Derby can be cheaper when compared to those departing from Broome. If there was one attraction that we can highly recommend, it would have to be this one. It’s not a cheap tour, but well worth it. And if you can stretch your holiday budget a bit further, you can even stay out overnight by the waterfalls on houseboat accommodation. No doubt, it’s something you’ll remember for a long time. You can visit Broome and Derby all year around, however the roads on the Dampier Peninsula can be closed due to weather conditions. Be aware accommodation can be at a premium during the months of June, July and August, so it’s advisable to book ahead if you can fix your travel dates in advance.